For many people of faith, life comes by way of death. For Alf Siewers, life in the Orthodox Church came by way of the sad death of his beloved sister who he lost to a fatal illness when he was a teenager. This heart wrenching experience would serve as his first step to finding life in the ancient church of Christ. Alf’s journey to Orthodoxy was many years in the making. Having grown up in an intellectual atmosphere that was hostile to Christianity and where a background in Orthodoxy was centuries removed, Alf had little knowledge of Christian doctrine despite coming from a lineage that was rich in Christian history. Family roots included New England Puritanism, Irish Catholicism and early Christian kings of Norway who were of the Orthodox faith. Despite this religious diversity, Alf grew up Unitarian and eventually attended a Christian Science church. The gnostic, cultist atmosphere would cause him to leave as he was disturbed by the lack of true liturgical and Trinitarian traditions. When his sister was ill, he read the Bible and prayed in secret. He attended Lutheran and Episcopalian churches but as was the case with the other churches, he found them all to be lacking in the traditions that were so rich in his family’s heritage. Alf would find his way to a Russian Orthodox cathedral in Chicago and the experience proved to be a memorable one. The incense, the beauty, the prostrations and venerations of icons were unlike anything he had ever experienced. Conversations with the priest and his wife would leave Alf feeling a grace he had never known before. A few years later, while in graduate school, Alf visited a Greek Orthodox church after private studies of the faith increased his interest in it. Although he was once again drawn to the beauty of liturgy and the piety of the church community, Alf was not yet ready to fully engage in the fellowship of the Orthodox Church. He left for a time, but then returned. Seeing his conflict, the priest suggested that Alf visit an Orthodox monastery. 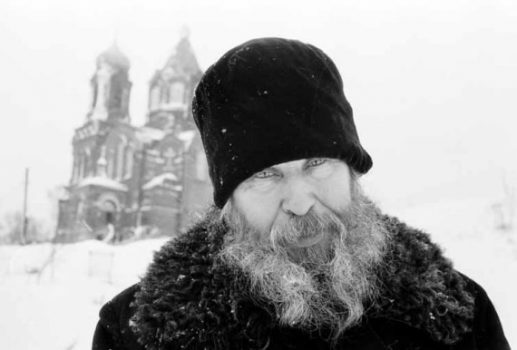 Under the care and guidance of the spiritual father he met at the monastery, and through much prayer and ascetic effort, Alf experienced the life-saving grace of Orthodox Christianity. As a patient finds healing of body in a hospital under the care of a doctor, Alf found healing of his hungry and ailing soul in the monastery under the care of his spiritual father. The combined healing of body, soul, mind and heart would give Alf a new life as an Orthodox Christian. That new life included a wife that he met at the cathedral in Chicago and witnessing the baptism of his children at Holy Cross. For Alf, and for many converts to the Orthodox faith, the path to life began with an unexpected death. Out of that death emerged an unexpected life in the Orthodox Church. Praise be to our Lord, Jesus Christ, for raising all the dead to eternal life!